I reeeeeeaaaaaaaaaally needed a chocolate chip cookie the other day. Like, needed. Which is fine, I'm used to these crazy cravings. So I went into my kitchen and started grabbing all my ingredients for your basic chocolate chip cookie when, !GASP! I was completely out of butter. What in the world?? What baker runs out of butter, ever? I clearly haven't been paying enough attention to life lately. So I sat back down and let out a "humph". I racked my brain for any idea on what I could eat that would taste like a chocolate chip cookie (toast smeared with melted chocolate chips, perhaps?) Then I remembered we had like 58 gallons of coconut oil! I've been rubbing the stuff all over my growing belly ever since we found out about little Baby Main and it's a wonderful fat to bake with! Score! I searched the interwebs for classic chocolate chip cookie recipes using the stuff and was happy to see there were soooo many out there! End result? I stuck with a blogger whom I've used before and trust and made these babies. They were incredibly scrumptious and just like a butter filled cookie! I seriously didn't miss the dairy version and was so happy to have a warm, gooey, chocolate chip cookie later that day. 1. Line a few sheet pans with silpats. 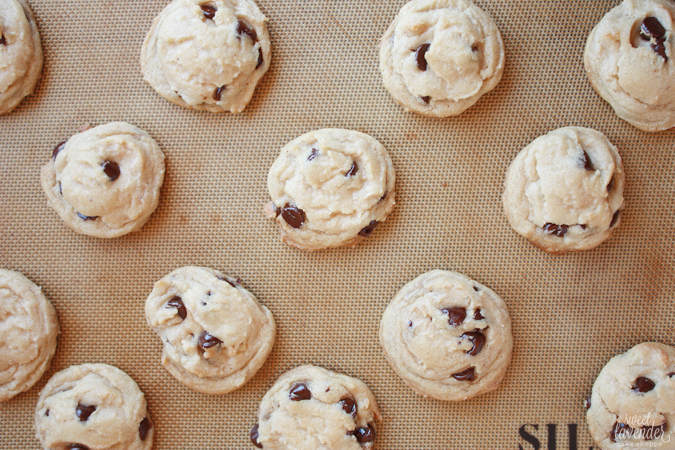 If you don't have silpats, you can line with parchment paper, but your baking time will vary. Watch the bottoms of your cookies on parchment. 2. In a bowl of a stand mixer, with the paddle attachment, cream together your coconut oil, brown sugar, vanilla sugar, egg and vanilla extract. You want the mixture to lighten a bit and become fluffy. This will take about 3-4 minutes on medium high. 3. Stop mixer and scrape down the sides and bottom of your bowl. Next, add your flour, cornstarch, baking soda, and sea salt and mix together on medium low speed until JUST combined. Do not over mix. 4. 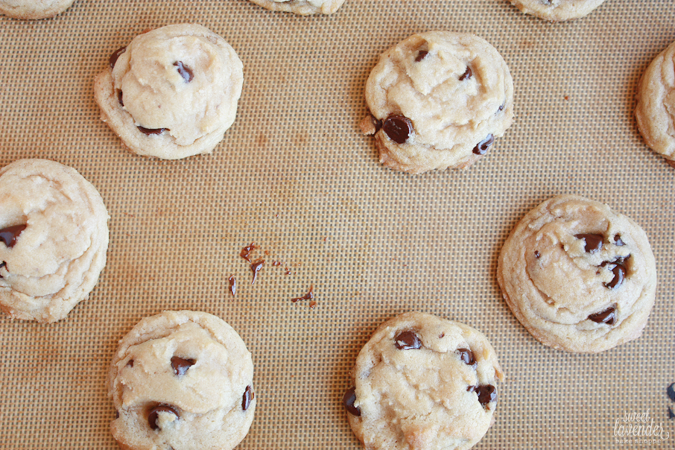 Finally, add your chocolate chips and mix together again until just combined. 5. Using a 1 1/2" cookie (ice cream) scoop (or a tablespoon), spoon dough into balls and place onto your silpat lined baking sheets about 2" apart. Place baking sheets into the fridge and allow to chill for 2 hours. Yes, this is a must. It makes sure your coconut oil solidifies and keeps your cookies from spreading out too flat. 6. When you're ready to bake, preheat oven to 350°F and place sheet pans in the center of your oven. Bake, turning once to ensure even browning, for about 12-13 minutes or until cookies have puffed, spread out a little and are golden brown around the edges. The middles may seem a little undercooked- that's ok. Allow cookies to rest on the pan 5-10 minutes before removing and allowing to cool on a wire rack. **Cookies will keep in an air tight container in the fridge for up to a week or at room temperature for up to 5 days. I am obsessed with coconut oil! Seriously, I use it for everything. Chocolate chip cookies are one thing I haven't tried making with it yet. It sounds like a great way to make them slightly healthier. The same exact thing has happened to me before! I was craving a chocolate chip cookie and didn't have all the ingredients. Great to know about this substitute! So glad to hear I'm not the only one! Sometimes you just NEED a cookie!